Intel Corp. has taken the wraps off of a new 45 nanometer processor technology that could be a cure-all for performance and power roadblocks threatening to frustrate the personal computer industry over next few years —and a reality in shipping Macs by the end of 2007. Known today only as "Penryn," the design uses a blend of hafnium and other rare metals in its transistors to keep the flow of electricity in check, reducing the amount of power leakage by as much as ten times over today's Core 2 and Xeon processors. 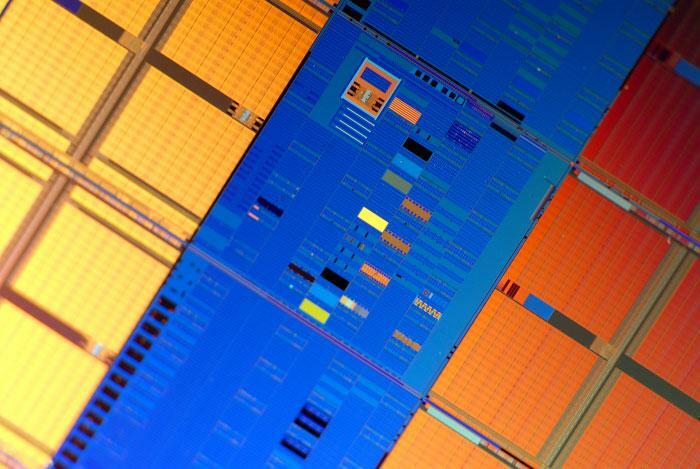 The refined process will allow many more transistors to fit on to a single chip —as many as 800 million in a quad-core version, Intel said —while still cutting back on the heat and power levels that are the bane of most CPUs. While fundamentally a mirror of the Core 2 architecture introduced in mid-2006, Penryn's nearly doubled chip density compared to existing 65 nanometer versions both reduces the delays in crunching instructions and leaves space for more features. The updated chips will contain a whopping 12MB of second-level cache on a dual-core model, up 50 percent from the Core 2 Duo. They'll also contain a new set of instructions titled SSE4 that will help with media decoding and other vector code. All this will be possible while continuing to ramp up clock speeds and improve power management, Intel said in a statement over the past weekend. The Santa Clara-based chipmaker has planned an equally pleasant surprise in a prompt release of the new technology. Even as rivals are still adjusting to the idea of 65nm processors,the company noted that the newfound freedom gained from switching to 45nm will let it ship Penryn as soon as the second half of 2007 —several months ahead of a similar development from AMD and IBM. Fully-functional processors are already being used in prototype machines. In total, Intel said fifteen different chips are in the works for systems ranging from workstations and servers to heat- and power-sensitive laptops. At least some of these designs are headed to the Mac platform. Breaking with Apple's tradition of absolute secrecy in advance of official releases, the chipmaker revealed that it had specifically booted and run Mac OS X on the new processor design. Unsurprisingly, no specific testbed models were mentioned; however, the sweeping nature of the Penryn overhaul points to Apple receiving the die-shrunk Core 2 and Xeon systems as soon as the summer's end.